Not very healthy, but very tasty wings, as in the chicken place and McDonald's, you can prepare at home without having the title of chef. Most importantly, choose fresh produce and observe some simple rules. Take a selection of the products the maximum attention, especially meat. Optimum use of chilled poultry, so the dish will be more juicy and flavorful. For cooking you'll need available products that can be purchased in any supermarket. Rinse chicken wings in cold water, put on a napkin, the moisture of the glass. Cut extreme phalanx is not roasted, as the meat on it. The remaining two will split near the joint. Fold the chicken in a bowl, sprinkle with salt and other spices, add the vinegar and garlic, mix thoroughly and leave for two hours. At this time, slightly crush the cereal. In a separate bowl, whisk the eggs (preferably with a mixer, but not to the foam. 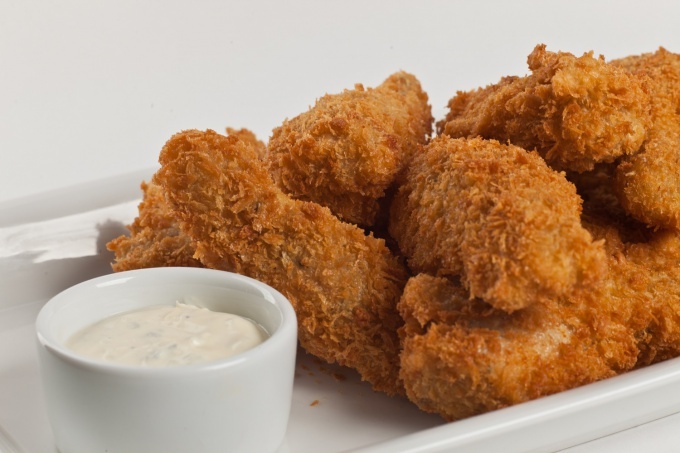 Marinated chicken wings dipped in wheat flour, then in eggs, then in breadcrumbs. Immediately immerse the wings in hot oil for three minutes – the oil should completely hide the meat. As soon as the chicken will get a Golden crust, it needs to get it and put on a towel or in a strainer to excess fat stack. You got chicken wings in McDonalds or Rostiks! If at first they are a little different, do not worry, because experience comes with time.